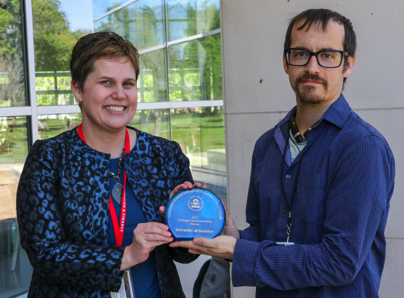 The Environmental Protection Agency presented the University of Houston with the 2017 Food Recovery Challenge national award during a March 20 ceremony. UH was notified in November that it had been selected to receive the award, thanks in large part to the hard work and effort of two food recovery programs: the student-driven Food Recovery Network at UH and the Campus Kitchen at UH. Stephen Sturdivant from the EPA’s Region 6 office in Dallas came to campus to present the award and congratulate all those whose hard work led to the honor. The presentation was held at Cougar Woods Dining Commons. In 2016, UH was one of more than 950 businesses, governments and organizations that participated in the EPA’s Food Recovery Challenge. Together, they diverted 740,000 tons of food from being sent to landfills or incinerated. Of all the groups that participated, the EPA handed out Food Recovery Challenge awards to just 16 of them in two categories: data-driven and narrative. The data-driven award recipients achieved the highest percent increases in their sector comparing year-to-year data. Narrative award winners excelled in the areas of source reduction, leadership, innovation, education and outreach and endorsement. UH was named the colleges and universities sector winner in the data-driven category. The Food Recovery Network at UH and the Campus Kitchen at UH works to recover food from the two dining commons and various retail dining locations on campus. Because of their work, UH was able to donate 39,763 pounds of food in 2016 to local organizations and food pantries. The EPA news release announcing all of the 2017 Food Recovery Challenge award winners is available online.